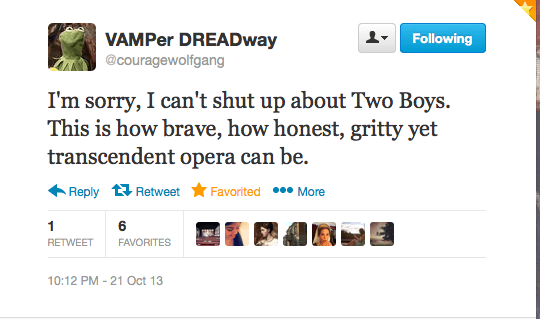 Opera is no stranger to rivalry. In fact, we crave it. Want proof? Opera audiences have split into factions regarding their favorite divas since Handel’s time, beginning with Francesca Cuzzoni and Faustina Bordoni. We don’t limit our loyalty to singers, either–the 18th century saw its share of nationalist faction-splitting between the French and Italians as to whose opera style reigned supreme. Sure. They’re 18th century examples… until I mention devotees taking sides regarding Renata Tebaldi and Maria Callas. And then then there is the rift that has been uncovered, yet again, between the generations of “old” opera lovers and “new” opera lovers, all thanks to Nico Muhly’s TWO BOYS. Reviews of the production popped up almost as quickly as an instant message, several prominent critics declaring the opera’s setting (2001) as practically “eons ago” compared to today’s technological age. Its main character was “badly dated” and her computer illiteracy was “hard to believe.” Perhaps most interestingly, many reviews said that Muhly and his librettist Craig Lucas had failed to make an emotional connection via the melodrama, and that “depth of character” was something the libretto lacked. The response on Twitter to these views was likewise rapid, and audience members chimed in to let critics know what they thought of the piece. Many of these tweets cited a generation gap as the reason for critics’ reaction. Many of us who listened to Muhly’s piece and responded favorably all found ourselves in adolescence around the time of the opera’s setting–2001. Though many were using chatrooms to explore the possibilities of cyberspace in the early years of the 2000s, it cannot be refuted that children and adolescents found themselves in a different experience altogether. The concepts of creating an identity, finding a community, receiving love–these were all altered with the advent of the digital age. They are concepts that have taken on a distinctly millennial meaning. It’s been fascinating for me to watch the discussion and engage in the dialogue. Regardless of your opinion, one thing remains true: an opera that causes a discussion is worth seeing. An opera that invites appropriate controversy is worth hearing. Music that causes us to feel, question, react (whether in disgust or in approval) is worth promoting and publicizing.